DML completes its small scale light 4 x 4 German armored car series with the dedicated long-range radio command version. 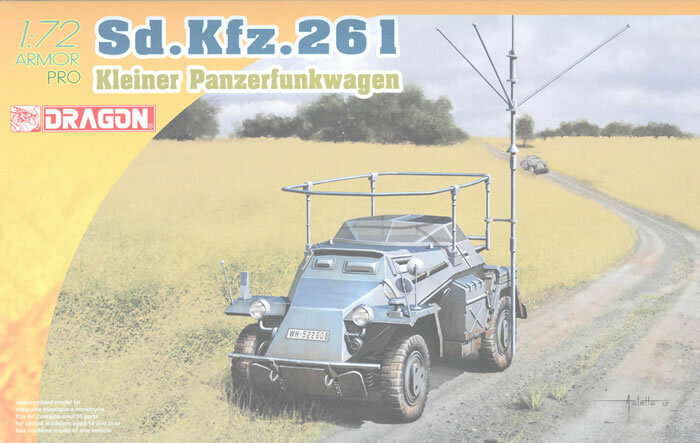 Like the preceding Sd.Kfz. 260 (Kit 7446) this kit provides only a single vehicle. The kit comes on four sprues of parts with separate one-piece upper and lower hull sections. All parts attach to the hull. However, whereas the first two had turrets this one simply has a solid plastic grenade screen with two flip-out hatches for access to the sides. It also provides the “rod” type antenna vice the “bedframe” antenna of the previous models. The lack of an interior is understandable but a shame as DML also offers the side doors as separate parts so it could be posed with the top and sides open. The chassis is fairly complete and the entire drive line (shafts and gearboxes) comes as a single unit. The wheels have separate hub protectors. New parts are provided to the basic 222/223 parts to make the 261, but unlike the 260 where the directions note the new fenders for the left side they do show the right side ones in this set. Two finishing options are offered: Unidentified Unit, 1941(grey, WH 522808); 2nd Panzer Division, 1941 (grey, insignia, unreadable registration plates). Number plates are provided along with a number jungle, all from Cartograf. Overall this is a nice little kit but as before one in the box makes it more expensive than its two predecessors.